Here we brought some good news for Airtel customers. As we know Airtel is one of the largest Airtel mobile operator in India. They are providing good service to their customers. Every day they are offering new plans to Airtel users. Now Airtel has come up with new offers with data sharing option. Now Airtel has introduced new deals like 50 % Airtel data cashback and Airtel Family data share plan and Smartphone surprise gift offer. Even it has launched new 3g/4G data sharing plan. It’s a great thing that they are giving new offers to customers. If you want to know more about these offers here i will share with you how to activate Airtel data sharing plans. The most important thing is you need to know the process otherwise how can you get these offers. Also check : How to Transfer Internet data (MBs) From one Mobile SIM to Another for all operators. Now you can share your 3 G data or 4 G data to someone like your family members or friends any one who would you like to share. But this process is valid only Airtel to Airtel customers. Before that you need to know about process and terms and conditions. During this process you can transfer only prepaid users. Here i will share with you how to activate Airtel Family Data Sharing Plans. 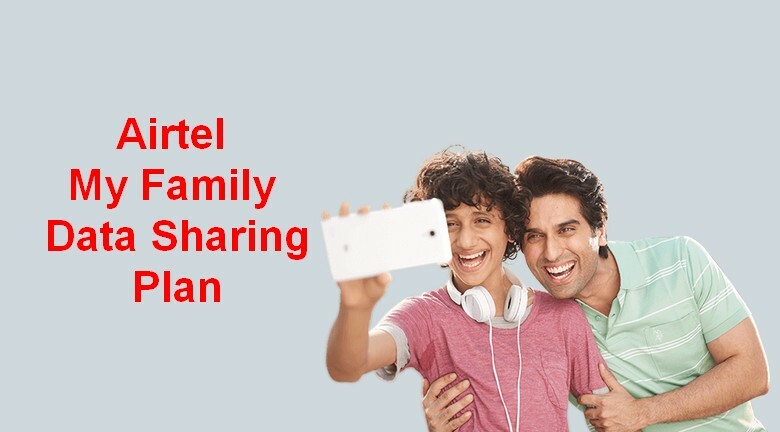 This time airtel has come up with new offer it’s called as family data share. Basically the main purpose of this process is you can share you internet 3 G/4 G data up to five members in your family or friends. This system is almost same as like myplan family postpaid offer. What you have to do is simple SMS to 121 and enter your mobile number and family data sharing plan with your desire internet data pack. You will get OTP (one time password) on your mobile number. Click on family data sharing plan on your mobile. That’s it now you can share your internet pack with family member. You can share 3 G data or 4 G data to your whole family in only one recharge. Airtel Data Sharing is completely free. There is no services charges for family data sharing plan. You can activate freely. You may ensure your small data wastage. You can share data with all your devices. Best way to use 3 G data with family members. In this scheme you can not share 2G data. You may only share Either 3 G data or 4 G data up to 5 members in your family. Not more that that. This offer is only valid for prepaid subscribers. This is not valid for postpaid users. The most important thing is all family members must be have Airtel prepaid customers only. All member must be in same telecom circle. If you want to delete any one of the family member the owner can do this thing. Once the family is created, owner all 3G/4G recharge will be automatically shared between all the members. If someone has added you to his Airtel family, and if you want to remove yourself from it you can simply send an SMS with the below format and you will be removed from the family. or Download Airtel My app to control all your family and manage your Airtel account. Now Airtel also giving 50 % cashback offer. But it has mentioned particular period of time. Who are using Airtel 2G/3G/4G internet pack in between 12.am to 6.am they can only get 50 % cash back. If you want to use this offer simply send SMS <NIGHT>to<121> or give miss call to this number <55555>. This scheme is available only for prepaid customers. Everyday Airtel is providing new offers to their customers. Now you can get surprise gifts and offers from airtel mobile operator. This offer is valid for both existing users and new users also. This offer is only for prepaid customers like who has entitled to get surprise gifts, double data recharge offers, free data offer up to one year, Bluetooth speakers and tablets. Even you may get 750 off by buying new smartphone on snap-deal showroom. These are the new latest data sharing plans for Airtel mobile operator. You can share your 3G/ 4G data with your family members in a very simple manner. Even you can save your money also because in only one recharge all your family can surf internet. So start using family data sharing plan and enjoy with your family members.